Families with children of all ages are welcome at St. James! We offer a variety of ways to involve children and youth in our parish life, as well as support families and connect them with each other. Below are links to pages that provide details on how children and their families can get involved at St. James. 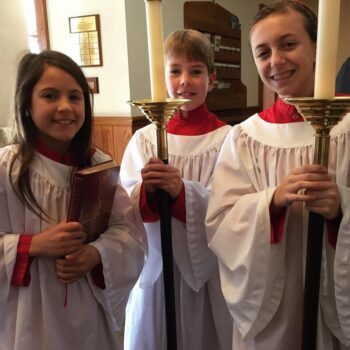 At the 9:30 service, children ages 4 and up gather at the back of the Church to process behind their own cross with the choir, clergy, and altar servers. The children proceed to our Parish Hall, where they have their own age-appropriate Liturgy of the Word (readings and teaching time). During the Passing of the Peace, they come back into church to participate in Holy Eucharist (communion) with their families. If you would prefer to keep your children with you in church at any time, however, you are welcome to do so! Religious-themed coloring materials and crayons are available at both entrances. Parents are also welcome to join their children for the children's liturgy whenever they would like. Baptism is a sacrament of the Episcopal Church, and St. James's regularly baptizes infants, toddlers, and older children. The Sacraments page provides more information about baptism in the Episcopal Church. If you are interested in having your child baptized at St. James's, please contact us. Last summer we offered something fun and different for families with children ages kindergarten through fifth grade: Kids Movie Night! On four Thursday evenings from 5:30 to 7:30 kids enjoyed dinner and then watched a movie. It was a chance for young families to bring their children to movie nights and head out for dinner or enjoy some free time. The cost was $10 per child with a $25 family maximum which included dinner. We will not have a summer program this year, but check back to see what we have lined up for summer 2020! For more information contact Priscilla Hooper. Are you looking for something different to do with your family on a Friday evening? Come to Fourth Friday pizza night for families with young children on Friday, April 26. We’ll meet in the dining room from 5:30-7:30 for pizza. Adults can BYOB and we'll have a kid-friendly movie set up in the teen room after the kids eat. This is a great opportunity for young parish families to get together and let their kids get to know each other better, too. We ask for a donation of approximately $5-10 per family to cover the cost of pizza. Please email Kerri Raissian for more information. Our next family night will be held on Friday, May 24.